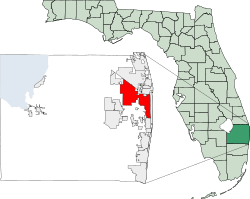 Location in Palm Beach County and the state of Florida. 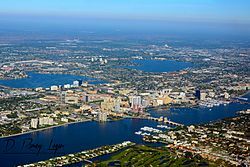 West Palm Beach is a city in and the county seat of Palm Beach County, Florida, United States. It is one of the three main cities in South Florida. The population was 100,343 (revised) at the 2010 census. The University of Florida Bureau of Economic and Business Research (BEBR) estimates a 2016 population of 108,896, a 7.9% increase from 2010. It is the oldest municipality in the Miami metropolitan area, having been incorporated as a city two years before Miami in November 1894. 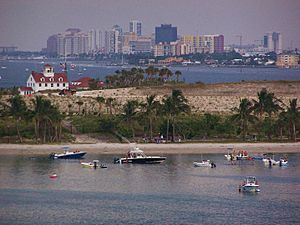 Although West Palm Beach is located approximately 68 miles (109 km) north of Downtown Miami, it is still considered a principal city within the Miami metropolitan area, due to the solid urbanization between both cities. The estimated population of the Miami Metropolitan area, which includes all of Palm Beach County, was 6,012,331 people at the 2015 census. The beginning of the historic period in south Florida is marked by Juan Ponce de León's first contact with native people in 1513. Europeans found a thriving native population, which they categorized into separate tribes: the Mayaimi in the Lake Okeechobee Basin and the Jaega and Ais people in the East Okeechobee area and on the east coast north of the Tequesta. When the Spanish arrived, there were perhaps about 20,000 Native Americans in south Florida. By 1763, when the English gained control of Florida, the native peoples had all but been wiped out through war, enslavement, or European diseases. Other native peoples from Alabama and Georgia moved into Florida in the early 18th century. They were of varied ancestry, but Europeans called them all "Creeks." In Florida, they were known as the Seminole and Miccosukee Indians. The Seminoles clashed with American settlers over land and over escaped slaves who found refuge among them. They resisted the government's efforts to move them to the Indian Territory west of the Mississippi. Between 1818 and 1858, three wars were fought between Seminoles and the United States government. By 1858, there were very few Seminoles remaining in Florida. The area that was to become West Palm Beach was settled in the late 1870s and 1880s by a few hundred settlers who called the vicinity "Lake Worth Country." These settlers were a diverse community from different parts of the United States and the world. They included founding families such at the Potters and the Lainharts, who would go on to become leading members of the business community in the fledgling city. The first white settlers in Palm Beach County lived around Lake Worth, then an enclosed freshwater lake, named for Colonel William Jenkins Worth, who had fought in the Second Seminole War in Florida in 1842. Most settlers engaged in the growing of tropical fruits and vegetables for shipment the north via Lake Worth and the Indian River. By 1890, the U.S. Census counted over 200 people settled along Lake Worth in the vicinity of what would become West Palm Beach. The area at this time also boasted a hotel, the "Cocoanut House", a church, and a post office. The city was platted by Henry Flagler as a community to house the servants working in the two grand hotels on the neighboring island of Palm Beach, across Lake Worth in 1893, coinciding with the arrival of the Florida East Coast railroad. Flagler paid two area settlers, Captain Porter and Louie Hillhouse, a combined sum of $45,000 for the original town site, stretching from Clear Lake to Lake Worth. 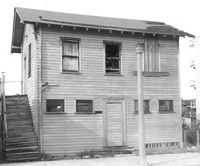 On November 5, 1894, 78 people met at the "Calaboose" (the first jail and police station located at Clematis St. and Poinsettia, now Dixie Hwy.) and passed the motion to incorporate the Town of West Palm Beach in what was then Dade County (now Miami-Dade County). This made West Palm Beach the first incorporated municipality in Dade County and in South Florida. The town council quickly addressed the building codes and the tents and shanties were replaced by brick, brick veneer, and stone buildings. The city grew steadily during the 1890s and the first two decades of the 20th century, most residents were engaged in the tourist industry and related services or winter vegetable market and tropical fruit trade. In 1909, Palm Beach County was formed by the Florida State Legislature and West Palm Beach became the county seat. In 1916, a new neo-classical courthouse was opened, which has been painstakingly restored back to its original condition, and is now used as the local history museum. The city grew rapidly in the 1920s as part of the Florida land boom. The population of West Palm Beach quadrupled from 1920 to 1927, and all kinds of businesses and public services grew along with it. Many of the city's landmark structures and preserved neighborhoods were constructed during this period. Originally, Flagler intended for his Florida East Coast Railway to have its terminus in West Palm, but after the area experienced a deep freeze, he chose to extend the railroad to Miami instead. The land boom was already faltering when city was devastated by the 1928 Okeechobee hurricane. The Depression years of the 1930s were a quiet time for the area, which saw slight population growth and property values lower than during the 1920s. The city only recovered with the onset of World War II, which saw the construction of Palm Beach Air Force Base, which brought thousands of military personnel to the city. The base was vital to the allied war effort, as it provided an excellent training facility and had unparalleled access to North Africa for a North American city. Also during World War II, German U-Boats sank dozens of merchant ships and oil tankers just off the coast of West Palm Beach. Nearby Palm Beach was under black out conditions to minimize night visibility to German U-boats. The 1950s saw another boom in population, partly due to the return of many soldiers and airmen who had served in the vicinity during the war. Also, the advent of air conditioning encouraged growth, as year-round living in a tropical climate became more acceptable to northerners. 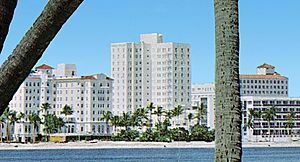 West Palm Beach became the one of the nation's fastest growing metropolitan areas during the 1950s; the city's borders spread west of Military Trail and south to Lake Clarke Shores. However, many of the city's residents still lived within a narrow six-block wide strip from the south to north end. The neighborhoods were strictly segregated between White and African-American populations, a legacy that the city still struggles with today. 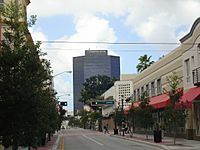 The primary shopping district remained downtown, centered around Clematis Street. In the 1960s, Palm Beach County's first enclosed shopping mall, the Palm Beach Mall, and an indoor arena were completed. These projects led to a brief revival for the city, but in the 1970s and 1980s crime continued to be a serious issue and suburban sprawl continued to drain resources and business away from the old downtown area. By the early 1990s there were very high vacancy rates downtown, and serious levels of urban blight. 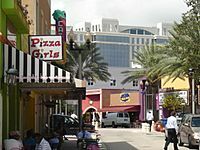 Since the 1990s, developments such as CityPlace and the preservation and renovation of 1920s architecture in the nightlife hub of Clematis Street have seen a downtown resurgence in the entertainment and shopping district. 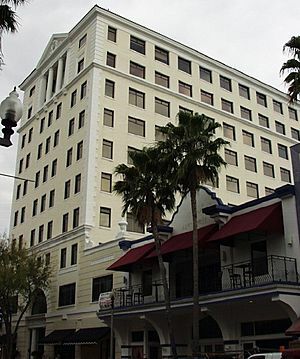 The city has also placed emphasis on neighborhood development and revitalization, in historic districts such as Northwood, Flamingo Park, and El Cid. Some neighborhoods still struggle with blight and crime, as well as lowered property values caused by the Great Recession, which hit the region particularly hard. Since the recovery, multiple new developments have been completed. The Palm Beach Mall, located at the Interstate 95/Palm Beach Lakes Boulevard interchange became abandoned as downtown revitalized - the very mall that initiated the original abandonment of the downtown. The mall was then redeveloped into the Palm Beach Fashion Outlets in February 2014. A station for All Aboard Florida, a high speed passenger rail service serving Miami, Fort Lauderdale, West Palm Beach, and Orlando, is under construction as of July 2015. According to the United States Census Bureau, this city has a total area of 58.2 square miles (151 km2), of which 55.1 square miles (143 km2) is land and 3.1 square miles (8.0 km2) (5.26%) is water. Due to vast areas of wetland immediately to the west of the city's downtown, growth took place to the north and south in a linear fashion. Until the 1960s, the city was no more than several blocks wide but over 100 blocks in length. Large scale development finally expanded to the west of the city with improved access and drainage in the 1960s. However, the city boundaries were not expanded much with the exception of the "Water Catchment Area", an uninhabited area in the northwest part of the city. 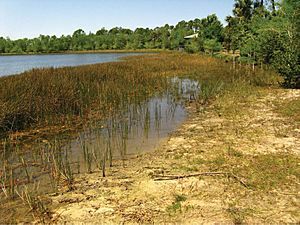 Known as Grassy Waters, it now serves as a reservoir for the city drinking water as well as a nature preserve. 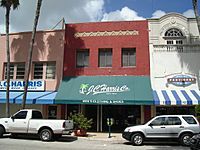 Bel Air Historic District: Developed from 1925 to 1935 as a neighborhood for tradesmen and real estate salesmen who helped develop Palm Beach County, some of Belair was originally a pineapple plantation owned by Richard Hone. Hones's frame vernacular house, built around 1895, still stands at 211 Plymouth Road. After Hone was murdered in 1902, his property was sold to George Currie, who created Currie Development Co. But before it was developed, the land was sold to William Ohlhaber, who raised coconut palms and ferns. Eventually, Ohlhaber platted the subdivision and sold off lots. The first house built in the subdivision was Ohlhaber's mission-style home at 205 Pilgrim. Ohlhaber's grandson said Ohlhaber bought the tract to provide dockage for his 90-foot (27 m) yacht, but the yacht ran aground in the Gulf of Mexico and never reached Lake Worth. In 1947 Hone's house was bought by Max Brombacher, Henry Flagler's chief engineer, and it remains in the Brombacher family today. Belair became West Palm Beach's fourth historic district in August 1993. Central Park: Central Park is a collective name for several subdivisions north of Southern Boulevard. It originally was part of the Estates of South Palm Beach (which went from Wenonah Place to Pilgrim Road east of Dixie Highway). Like other West Palm Beach neighborhoods, the Estates of South Palm Beach boomed after Henry Flagler's descent on Palm Beach. In 1884, James W. Copp, a bachelor in the boating business, borrowed $367.20 from Valentine Jones to buy the land. The ownership of what is now known as Central Park changed hands many times before being developed. Around 1919, the tropical wilderness was transformed into an exclusive neighborhood with curbed roads, sidewalks and a pier (at the foot of what is now Southern Boulevard). The neighborhood became part of West Palm Beach in 1926, and was named a city historic district in December 1993. In 1999 the neighborhood was listed in the National Register of Historic Places. El Cid: Noted for its Mediterranean revival and mission-style homes, El Cid developed in the height of Florida's real estate boom. 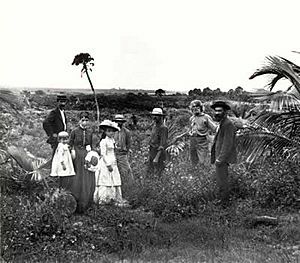 In the late 19th century, most of the land north of Sunset Road was pineapple fields, but the crop dwindled in the early 20th century. Pittsburgh socialite Jay Phipps subdivided the old pineapple fields in the 1920s. He named it El Cid, after the celebrated Spanish hero, Rodrigo Diaz de Bivar, who conquered Valencia in 1094. He was called "Cid", meaning "lord". El Cid became a city historic district in June 1993. In 1995 the neighborhood was listed in the National Register of Historic Places. Flamingo Park: Originally a pineapple plantation, Flamingo Park was established by local contractors and developers, who saw the potential in this area—one of the highest coastal ridge sections from downtown West Palm Beach to Miami. Some ridge houses even had ocean views from upper floors. Houses cost about $10,000 to $18,000 in the boom era, and many buyers were owners of shops and businesses on fashionable Dixie Highway nearby. Recently, residents rallied to have stop signs installed throughout the neighborhood and have banded together to ward off commercial and industrial zoning. Property values are rising as residents renovate and restore Spanish-style houses. Most of the homes in the neighborhood, developed from 1921 to 1930, are mission style, but nearly every style is represented. There are many Mediterranean revival-style houses along the high ridge line. Only two buildings in the historic district are known to have been designed by architects: 701 Flamingo Drive designed by Harvey and Clarke, and the Armory Arts Center designed by William Manly King. The neighborhood became a West Palm Beach historic district in January 1993 and was listed in the National Register of Historic Places in 2000. Grandview Heights: One of the city's oldest neighborhoods still intact, Grandview Heights was built as an extension of Palm Beach Heights from around 1910 to 1925. Almost all of Palm Beach Heights and half of Grandview Heights was demolished in 1989 to make way for the proposed Downtown/Uptown project, which became CityPlace. Grandview Heights originally attracted construction workers who helped build the luxury hotels, ministers and store owners. The neighborhood has one of the city's best collection of early craftsman-style bungalows, as well as some modest, Mediterranean revival-style homes. The neighborhood became a West Palm Beach historic district in 1995 and was listed in the National Register of Historic Places in 1999. Mango Promenade: Mango Promenade became a West Palm Beach historic district in 1995 and was listed in the National Register of Historic Places in 1999. Lies just south of Palm Beach Atlantic University. Northboro Park: An expansion of Old Northwood, Northboro Park was mostly custom houses for upper-middle-class professionals. Most of the houses are Mediterranean revival, mission and frame vernacular. Developed from 1923 to 1940, the neighborhood became the city's second historic district (November 1992) and the historic designation may soon expand north to 45th Street. The oldest building in the neighborhood is Northboro Elementary School at 36th Street and Spruce, built in 1925 by DaCamara and Chace. The demolition of Northboro Elementary School began in late 2009. The first home in Northboro Park is 418 36th St., built in 1923. Northwest: West Palm Beach's first historic district to be included on the National Register of Historic Places (February 1992), the Northwest neighborhood was first settled in 1894, when the black community was moved from the Styx in Palm Beach to West Palm Beach. It also served as the city's segregated black community from 1929 to 1960 (along with Pleasant City). Northwest remains a predominantly black community but according to the city planning department, most middle- and upper-class blacks moved to other neighborhoods after desegregation. 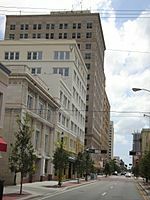 Tamarind and Rosemary Avenues were the commercial centers for blacks by 1915, but most commercial buildings have been demolished or remodeled so the architecture is no longer significant. There are still good examples of late 19th- and early 20th-century American bungalow/craftsman-style homes in this neighborhood, which also has mission, shotgun, Bahamian vernacular and American Foursquare styles. The Alice Frederick Mickens house, at 801 Fourth St., is listed on the National Register of Historic Places. Mickens was a philanthropist and humanitarian who promoted education for black youth. Another notable house is the Gwen Cherry house at 625 Division Ave. Cherry, Florida's first black woman legislator and a resident of Miami, inherited the house from relative Mollie Holt, who built the house in 1926. Now it is the Palm Beach County Black Historical Society. The Northwest neighborhood was listed in the National Register of Historic Places in 1992. The next year the neighborhood became a West Palm Beach historic district in 1993. Old Northwood Historic District: Old Northwood was developed from 1920 to 1927—the height of the city's real estate boom. The Pinewood Development Co., platted and developed the area. Old Northwood became a neighborhood of what was considered extravagant Mediterranean revival, mission and frame vernacular houses, at $30,000 to $36,000. The buyers were professionals, entrepreneurs and tradesmen. Among them was David F. Dunkle, who was mayor of West Palm Beach. There are houses here designed by notable architects John Volk (best known for his Palm Beach houses), William Manly King (who designed Palm Beach High School and the Armory Arts Center) and Henry Steven Harvey (whose Seaboard Railroad Passenger Station on Tamarind Avenue is listed in the National Register of Historic Places). The neighborhood became a West Palm Beach historic district in 1991 and listed in the National Register of Historic Places in June 1994. 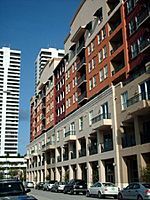 Northwood Hills Historic District: On August 4, 2003, the City Commission designated the Northwood Hills neighborhood as the 13th Historic District in the City of West Palm Beach. Northwood Hills comprises the area from 29th Street on the South to 39th Court on the North. The east side of Windsor is the Western boundary, and Greenwood Avenue is the Eastern boundary. The Neighborhood Association has worked several years to achieve the distinction of historic designation. This is the first district to be designated since 1996. Northwood Hills has a number of Mission Revival houses, a significant collection of Post-World War II architecture, a unique street layout, and one of the highest elevations in the city. The Northwood Hills neighborhood has also elected to allow the establishment of Bed and Breakfast establishments within the neighborhood. Prospect Park: Promoted as a high-end neighborhood patterned after the prominent Prospect Park district in Brooklyn, this area consisted of mostly smaller estates for prominent businesspeople and northern investors. The neighborhood has a high concentration of Mediterranean revival and Mission revival houses. It was developed from 1920 to 1935 and became a city historic district in November 1993. West Northwood Historic District: Cashing in on the real estate boom, developers of West Northwood built speculative and custom houses for upper-middle-class professionals from 1925 to '27. Dominant architectural styles are Mediterranean revival and mission. Although the area was declining, that has reversed in recent years, as more investors buy and restore the houses. West Northwood became a city historic district in August 1993. The estimated 2012 population of West Palm Beach and the immediately adjacent Census Designated Places is 134,795. Much of this urbanized area lies directly west of the city and includes the neighborhoods of Westgate, Belvedere Homes, Lakeside Green, Century Village, Schall Circle, Lake Belvedere Estates, Plantation Mobile Homes, and Golden Lakes. These neighborhoods are not technically within the boundaries of West Palm Beach, being located in unincorporated Palm Beach County. However, residents possess a "West Palm Beach" address and urban services, such as police, fire, parks, water and sewer, are provided by a combination of Palm Beach County and the City of West Palm Beach in these areas. 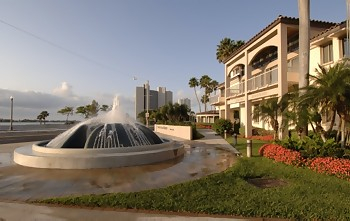 The City of West Palm Beach also provides water and sewer service to the Town of Palm Beach. 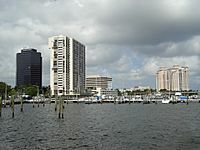 The contiguous "urbanized" area, of which West Palm Beach is the core city, includes most of eastern Palm Beach County and has an estimated 2008 population of around 1,250,000. West Palm Beach skyline from Okeechobee Blvd. 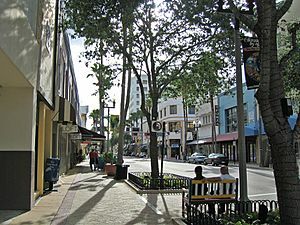 West Palm Beach has a tropical rainforest climate (Köppen Af), with mean temperatures in all months above 64.4 °F (18 °C). This tropical climate allows for many species of tropical plants throughout the city. The wet season—May through October—is hot, humid, and wet. The average window for 90 °F (32 °C) temperatures is April 20 through October 8, but temperatures of 100 °F (38 °C) or higher have only occurred four times since record-keeping began in 1888. During this period, more than half of the days bring afternoon thunderstorms and sea breezes that cool the air for the rest of the day. The dry season—November through April—is warm and mostly dry, with 80 °F (27 °C) temperatures remaining fairly commonplace even from December through February. However, the area experiences occasional cold fronts during this period, with daytime temperatures below 65 °F (18 °C) and lows dropping to 45 °F (7 °C) or further. These fronts last only a few days before high temperatures return to the 70s to 80s and low temperatures to the mid-60s. During a severe and prolonged cold snap in January 2010, the city recorded 12 consecutive days of low temperatures at or below 45 °F (7 °C). Nine of the twelve days were below 40 °F (4 °C), with several mornings at or near freezing. Annual average precipitation is 63 in (1,600 mm), making West Palm Beach the fourth wettest city in the country after Mobile, Alabama; Pensacola, Florida; and New Orleans. Most of the precipitation occurs during the wet season of May through October, mainly as short-lived heavy afternoon thunderstorms. Occasionally, stalled cold fronts in the fall and spring can also lead to heavy and prolonged rainfall. The only record of snow was on January 18, 1977, when flurries were reported. West Palm Beach has an average of 133 wet days and 234 sunny days annually. The hurricane season is officially from June 1 through November 30, with the peak months being August, September, and October. The city has received direct or near direct hits from hurricanes in 1928, 1947, 1949, 1964, 1965, 1979, 1992, 1999, 2004, and 2005. As of the census of 2010, there were 54,179 households, out of which 20.8% were vacant. As of 2010, 22.4% had children under the age of 18 living with them, 34.3% were married couples living together, 13.6% had a female householder with no husband present, and 47.5% were non-families. 37.6% of all households were made up of individuals and 11.8% had someone living alone who was 65 years of age or older. The average household size was 2.26 and the average family size was 3.02. As of 2000, the population was spread out with 21.3% under the age of 18, 9.8% from 18 to 24, 31.5% from 25 to 44, 21.4% from 45 to 64, and 16.0% who were 65 years of age or older. The median age was 37 years. For every 100 females there were 97.3 males. For every 100 females age 18 and over, there were 94.8 males. In 2000, the median income for a household in the city was $36,774, and the median income for a family was $42,074. Males had a median income of $30,221 versus $26,473 for females. The per capita income for the city was $23,188. About 14.5% of families and 18.9% of the population were below the poverty line, including 29.2% of those under the age of 18 and 14.8% of those ages 65 and older. As of 2000, those who spoke only English at home accounted for 72.49% of all residents, while those who spoke Spanish made up 17.71%, French Creole (mainly Haitian Creole) 4.46%, 1.27% spoke French, German was spoken by 0.62%, and Italian speakers made up 0.52% of the population. Norton Museum of Art: is the largest art museum in Florida and also organizes traveling exhibits. The permanent collection features 19th and 20th century European and American art, Chinese, contemporary art and photography. 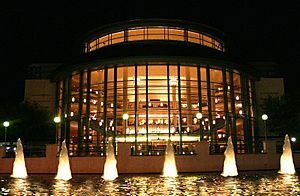 Raymond F. Kravis Center for the Performing Arts: Built in 1992, the Kravis Center hosts performances of music, dance, opera and theatre. Meyer Amphitheater: An abandoned Holiday Inn, demolished on New Year's Eve 1993 and transformed into an outdoor waterfront amphitheater. Richard and Pat Johnson Palm Beach County History Museum: is operated and maintained by the Historical Society of Palm Beach County, and is in the Historic 1916 Court House in downtown West Palm Beach. 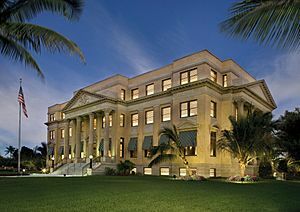 The museum provides access to Palm Beach County history through on-site investigation in the Research Library, on-line research on www.pbchistoryonline.org, the Public Programming Series and the Distinguished Lecture Series. The museum is free to visitors and offers Docent-led tours for adults and school groups. Palm Beach County Convention Center: A complex with 350,000 square feet (33,000 m2) of exhibit halls and meeting rooms in downtown West Palm Beach. The Carefree Theatre: Built in 1940, in the historic Flamingo Park district, it was variously an art house cinema and alternative music performance venue until severely damaged by Hurricane Wilma. There is a Jewish community offering learning and cultural activities. SunFest: an annual music, art, and waterfront festival in Florida, founded in 1982 to draw visitors to the area during the "shoulder season" of April and May. 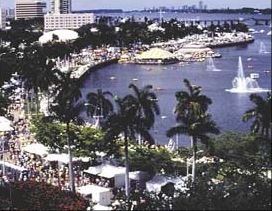 SunFest has an annual attendance of more than 275,000 people. Artists who have performed include Wilco, Carrie Underwood, John Mayer, Ray Charles, James Brown, Ludacris, Nelly, Lenny Kravitz, Dizzy Gillespie, Bob Dylan, Kenny G, Earth Wind and Fire, Cyndi Lauper, Smashing Pumpkins, MGMT, and The Wailers. SunFest is a 501(c)3 non-profit organization. Barrett-Jackson Collector Car Auction: Classic car auction held every March in the South Florida Expo Center. Clematis Street: is West Palm Beach's historic "main street" and shopping venue, home to Clematis by Night, an outdoor event held on the street with live music and food. CityPlace: Opened in 2000 on re-developed land where dilapidated single family homes and apartments once stood, CityPlace houses a multi-plex movie theater, night clubs (comedy, dance), restaurants, clothing and home-decor retail outlets and multi-story town houses and apartments. Antique Row: is a shopping district on the south side of the city along Dixie Highway. Architectural Digest, The New York Times, Art & Antiques, and House Beautiful have all noted Antique Row as one of the east coast's premier antique districts, considered the "antique design center" of Florida. Northwood Village: is an historic commercial district north of downtown. The city invested money in rebuilding the streetscape and promoting the area as an arts district. Air: The city is served by Palm Beach International Airport, located in unincorporated Palm Beach County. The airport attracts people from all over the county as well as from the Treasure Coast and Space Coast counties to the north. In 2014 there were over 6.5 million passengers who passed through the gates of PBIA making it the 52nd busiest airport in the nation. Bicycle The city's flat terrain, paved streets, and year-round climate soon earned it the designation as the "bicyclingest town in the U.S.A.". The historic core consists of a dense grid of narrower streets, as laid out by Henry Flagler. Clematis Street was one-lane each direction with a speed limit of 12 mph, and the middle of the street between lanes was used to park bicycles. Although the popularity of bicycling declined during the later half of the 20th century, it has recently increased in popularity. In addition, a bike share program, SkyBike, was introduced in 2015. Highways: U.S. 1 passes though the city's downtown, commercial, and industrial districts. 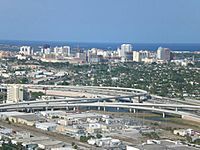 Interstate 95 bisects the city from north to south with multiple interchanges serving West Palm Beach, including an entrance to Palm Beach International Airport. Florida's Turnpike passes through West Palm Beach further west, connecting with the western suburbs of Royal Palm Beach and Wellington. State Road 80, running east-west, is a partial expressway, that runs from Interstate 95 to State Road 7. Rail: Tri-Rail commuter rail system serves the city from a historical station located on the west side of Tamarind Avenue, just east of I-95. Tri-Rail provides commuter rides north to Mangonia Park and south to Miami. Amtrak has daily trains arriving and departing to points north. CSX Transportation and the Florida East Coast Railway also serve the city. All Aboard Florida began track upgrades in 2015 in preparation for high-speed passenger service serving Miami, FL through Orlando, FL. Trolley: There is a free downtown trolley that provides transportation around downtown including Clematis, City Place and Waterfront districts of the city. Bus: Greyhound Lines operates scheduled intercity bus service out of the train station on the west side of Tamarind Avenue. 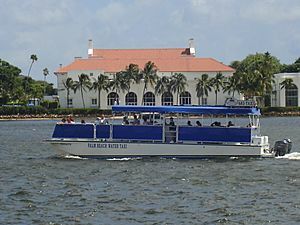 Palm Tran, the Palm Beach County municipal bus service, operates scheduled service throughout the city and the suburban areas of Palm Beach County. Port: The Port of Palm Beach is located on the northern edge of the city limits. It is the fourth busiest container port in Florida and the 18th busiest in the continental United States. In addition to intermodal capacity, the Port is a major modal point for the shipment of various goods as well as being the home to several small passenger cruise lines. Water Taxi: As a waterfront city there is specific need for water transportation between points in the city and surrounding areas. Waterway transportation is available to and from the downtown Clematis Street District, Sailfish Marina Resort, waterfront attractions, Peanut Island and special events. West Palm Beach, Florida Facts for Kids. Kiddle Encyclopedia.